"Where is everyone going for after hours? Old Absinthe? d.b.a?" This short conversation is repeated nightly as official Tales of the Cocktail evening events wind down. Where will party continue for a crowd already saturated with specialty cocktails, complimentary tastings, liquid pool parties, and spirited dinners? Where to call it a night depends on the day of the week, but generally there are a few stalwart establishments where the spirits community gathers to party until the wee hours. First stop is Jean Lafitte's Old Absinthe House on the corner Bourbon and Bienville streets, a fixture in New Orleans cocktail history for over a century. It is the home of the famous Absinthe House Frappe cocktail, which was created in 1860s by Cayetano Ferrer, and has quite a cocktail menu of traditional New Orleans and Southern drinks. "Everyone You Have Ever Known or Ever Will Know Ends up at the Old Absinthe House." On Friday night, as the Grand Marnier Bar Room Brawl wrapped up, I posed the question to Catdaddy Moonshine Bar chef challenge winner Payman Bahmani and Sam Ross of Milk & Honey. Old Absinthe House was the consensus. So we left Generations Hall and hailed taxis to Bourbon Street. The bar's ambiance is a wonderful mish-mash of history and customer driven decoration. 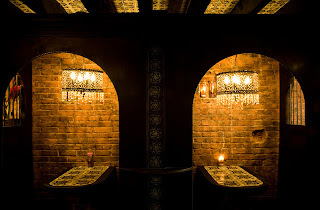 Business and "calling" cards are stapled to the walls, it has a gritty dive bar feel, comely female bartenders, worn out oak bar, and all sorts of under garments hang from the ceiling along side antique chandeliers. The place is like Cheers! when we enter with recognizable faces packed three deep to the bar. The Tales crowd kept the party going as promised. Their drink of choice? Beer and a shot. That's right. The world's best barkeepers and cocktail aficionados keep it simple at the Old Absinthe for Last Call. No frappes, no absinthe drips, no sazeracs, and for Godsake - no Ramos fizzes! Just an Abita or a Budweiser in a bottle, and a shot of tequila, Fernet, or turkey. That is the Tales wind down. The party overflowed into the street where merriment, conversation, and tomfoolery was not in short supply. Bonus: Hotel Monteleone is only three blocks away so the stumble home is a short one. Vaughan's Lounge at 4229 Dauphine in Bywater is a Thursday night tradition. Why take a taxi a few miles from the French Quarter to a divey roadhouse? 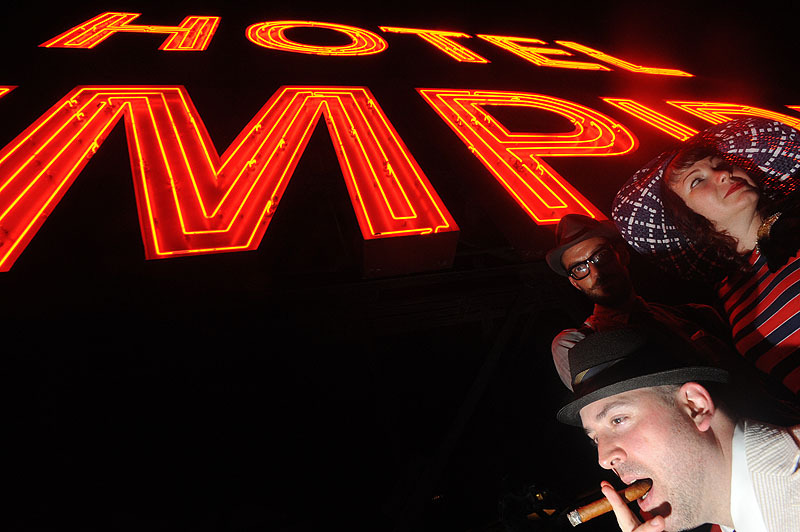 Kermit Ruffins and the BBQ Swingers jazz/brass band plays every Thursday until the wee hours. Vaughan's is an authentic Crescent City party that welcomes everyone. Play ping-pong in the back room, enjoy cheap drinks, and get your dance on to Kermit's krewe. Never agree to Green Chartreuse shots with certain notable Boston mixologists at 2:30am. If you agree that this is a good thing, then it is already to late for you. Exit Strategy: Take the cab driver's information on the way to Bywater so you can call them for extraction. Bywater, which is east of the French Quarter and most hotels, is a pretty desolate neighborhood after hours. It is not easy to flag a cab so call ahead when you are ready to head back to the hotel. Cash Bar and $10 cover but it is often waived late night. d.b.a at 618 Frenchmen Street on the outskirts of the French Quarter is the Big Easy outpost of the popular East Village watering hole. Like its' Yankee cousin, d.b.a. New Orleans has a tremendous selection of brown spirits and beers prominently displayed on massive chalk boards above the back bar. Try the Abita Imperial Stout and NOLA blonde ale to start, maybe an award winning Four Roses Yellow bourbon on the side. There is also live jazz nightly at d.b.a. Best feature, the come as you are attitude and no pretension. Mind you, this is the rated PG version of the Tales night cap destinations. There is a rated R version which is best experienced and not written about. 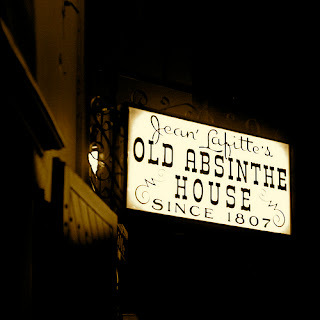 That said, see you at the Old Absinthe House where everyone ends up. Roosevelt Hotel, New Orleans - Saturday July 24th - I am happy to report the winners of the Tales of the Cocktail Spirited Awards 2010- many of whom were definitely due. Once again, New York City took the lion's share of prestigious awards including Best American Cocktail Bar, World's Best New Cocktail Bar, and World's Best Cocktail menu. As I went over in my post on Traveling Like Its 1960, these days one has to get creative to have a cocktail on a jet plane. Sure you can buy what ever swill the flight attendants are hawking for $5.00 but I like to experience high altitude flight my way. 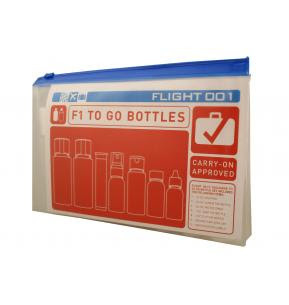 So in order to enjoy quality cocktails on the plane to New Orleans for Tales of the Cocktail one needs to bring your own in Flight 001's F1 To Go Bottles. In order to execute them, simply ask the flight attendant for a mixer and ice. For pre-made cocktails that do not require juice or mixer, ask for a bottle of water and cup of ice. Keep the water for post libation hydration and drink your cocktail on the rocks. This will be important for proper dilution which is missing in batching. Please note, that like the movie theater, Airlines frown upon bringing your own drinks on the plane. So keep this activity discreet but try not to alarm the other passengers who may equate you mixing multi-colored liquids to lighting up a sneaker. Request for water and cup of ice. Save the water, serve your drink on the rocks. Ask for vegetable or tomato juice on the rocks, take a hearty sip then add the Gin/Bitters mix. Stir and enjoy. Anejo Rum by Don Q - Correct your Coca-Cola on the rocks with Rum. Campari - Ask for Orange Juice on the rocks, instant Alitalia style eye opener. Créme de Violette in an aerosol spritzer. I sometimes pre-make Aviations, the spritz of CdV is lovely! Aromatic bitters in a dropper, because you hang over on the flight back will be much smoother with a few dashes of bitters added to club soda. Cin-Cin and have a great flight! Next stop Nawlins! 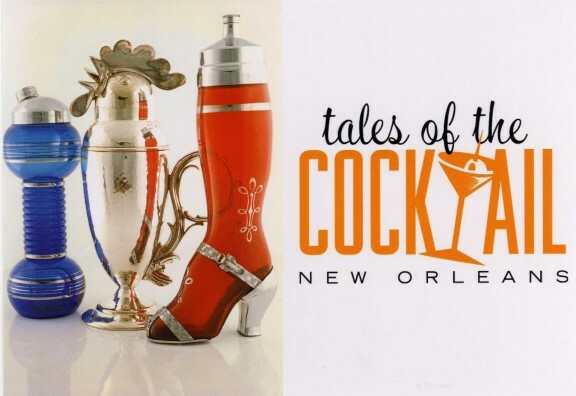 New Orleans - The 8th Annual Tales of the Cocktail, a culinary and spirits festival developed by Ann and Paul Tuennerman, kicked off today with a toast at the Hotel Monteleone. The world's best mixologists, bartenders, brand ambassadors, cocktail bloggers, liquor sponsors, and cocktail aficionados descend on the Big Easy for five days of seminars, "Spirited Dinners", competitions, tastings, and brand sponsored parties. Tales is a bona fide Star Trek convention for spirits enthusiasts. For the second year in a row, Loungerati dispatches their cocktail correspondent and bon vivant Fredo to the Crescent City. This time the man at seat F14 has Media Credentials and will be blogging/tweeting (in between sips) the event on Friday and Saturday. He will also be reporting for the Parkville Luminary, Kansas City's fastest growing weekly publication. Along with the lectures, competitions, tastings, happy hours, and parties, Fredo will be taking time to chronicle the events and sample the local fare. New Orleans isn't all Vieux Carrés and Sazeracs, attending Tales is a great way enjoy the culinary tradition and support the city's tourism. 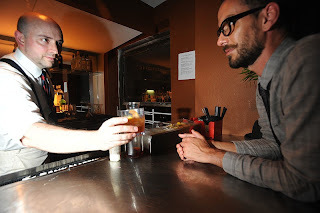 "On the Rocks" Happy Hour - a uber tasting of 23 spirits in one of their purest forms. USBG Milagro Tequila Margarita Competition - 28 bartenders from 15 different cities will put their best margaritas up against one another using Milagro Tequila. Bar Room Brawl presented by Grand Marnier at Generations Hall - Bar teams from around the country duke it out by creating original cocktails using Grand Marnier. The judges will crown one team the Champions of the World and attendees will determine the People's Champion. Rolling Out the Red Carpet for Rookies Seminar - This session would focus on techniques that experienced bar professionals can use to communicate good cocktail techniques and ingredients to rookie home bartenders. 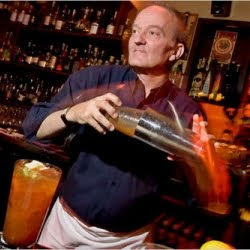 Robert Hess of Drinkboy is a featured Panelist. Tiki Now! The New Breed of Tiki Bar Seminar - An investigation and analysis from the death of the Tiki Bar to the resurgence to the new trends emerging. Plymouth Gin Bartender's Breakfast at 11pm! In addition, he may finagle a seat at the Spirited Awards Ceremony and Dinner presented by Pernod Ricard on Saturday night. This year Tales of the Cocktail did not offer individual tickets but rather sold tables of ten for $650. These were promptly snapped up by liquor brands and sponsors. So hopefully a bit of schmoozing and networking can materialize a seat for the Lounger. AMC's Mad Men begins it's fourth season on Sunday July 25th. The year is 1964, Don Draper and company have resurrected Sterling Cooper, Betty Draper has flown the coop, and many more surprises are in store. In anticipation of the premier night watch parties that will be popping up across the nation, the folks at AMC have come up with a retro cocktail guide of 1960s cocktails. This guide includes the usual suspects such as the Classic Martini (but sadly suggests vodka instead of traditional gin), Manhattan (with bourbon not rye), the Old Fashioned (fruit salad style with bourbon), Mint Julep, Tom Collins, etc. There are many mistakes in their recipes and whole genres are missing. Besides the technical errors in building some drinks and incorrect base spirits, there are also some bizarre selections. For example, The Pink Squirrel (creme de noyeau, creme de cacao, vodka, heavy cream) and the Dirty Martini (vodka, olive brine, dry vermouth). Are these really vintage 1964 cocktails? According to Gary Regan's The Joy of Mixology, the Pink Squirrel first appears in a 1966 edition of Old Mr. Boston (a bartender's guide) and "was still going fairly strong in the mid-seventies." No vodka is used in the recipe from Regan's book which is equal parts creme de noyau (an almond flavored pink liquor), white creme de cacao, and heavy cream. I doubt that this libation was popular enough at the time to be included in AMC's guide. The Dirty Martini is rumored to have origins dating back to Franklin D. Roosevelt. However, the drink did not become ubiquitous until the mid-1990s. It was the male version of the Cosmopolitan. I certainly would not classify it as a true early 1960s cocktail, more like something Vince Vaughn would have ordered in Jon Favreau's Swingers. Further, the cocktail guide has some glaring omissions. Most obvious, rum is not a base spirit in any of the cocktails in the guide. To me, this astonishing because rum was so common place at the time. Where is the Daiquiri? Where is the Cuba Libre? Did Americans boycott drinking Daiquiris in the early Sixties as a response to the Cuban Revolution? If so, why does the White Russian (which is included in AMC's guide) seem to"survive the anti-Soviet tensions."Dude!!! What about Tiki? 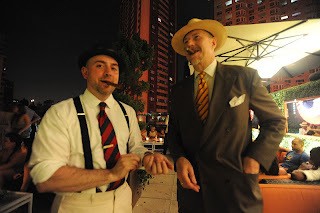 The Mad Men era was during the golden age of tiki cocktails with Trader Vic style bars in every city and town. At a minimum, I would have expected the Mai Tai to be on this list. Instead, we get no Mai Tai. No Zombie. No Fog Cutter. No Tiki! Once again rum is forgotten. 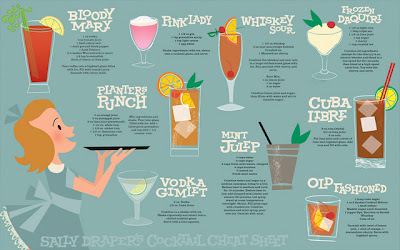 I think artist Dyna Moe captured the pulse of true Mad Men cocktails more than AMC's crack blog team. She actually did research in creating the illustrations in her Mad Men Illustrated series. Dyna's "The Usual Mommy?" piece takes inspiration from the kitsch cocktail menu/place mats that were so popular at bars and restaurants at the time. These place mats had an image of the drink, plus the recipes to make each one. She gets the cocktails of Mad Men correct and includes the Mai Tai, the Side Car, Seven and Seven, Tom Collins, Sloe Gin Fizz, the Manhattan, Brandy Alexander, and Screwdriver. 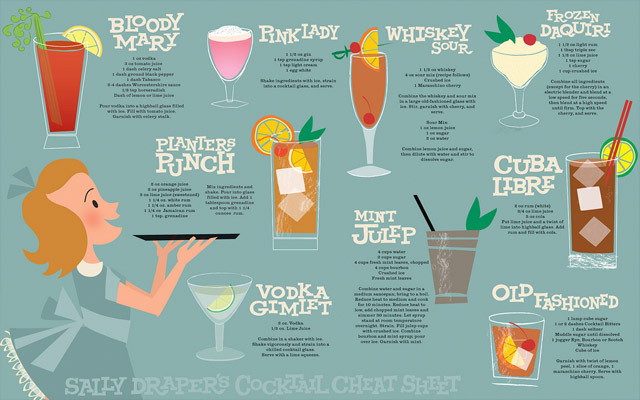 In a Season 2 illustration called the "Sally Draper Cheat Sheet," Dyna Moe highlights the Bloody Mary, Pink Lady, Frozen Daiquiri, Planter's Punch, Mint Julep, Old Fashioned, Whiskey Sour, Vodka Gimlet, and...wait for it...the Cuba Libre. We suggest that Watch party planners refer to the Sally Draper series for a more authentic list of early 1960s cocktails. Oh and skip the Pink Squirrel until Sally Draper mixes one for Mommy. 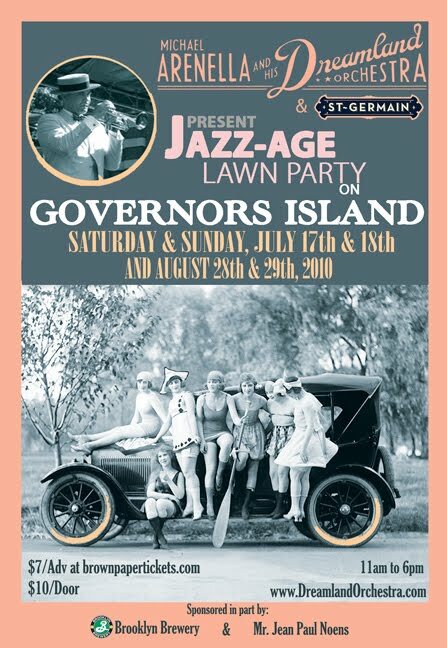 Under a shady grove of centuries-old trees, caressed by fresh sea air, a sprawling green surrounded by historic officers' quarters and 18th century naval ramparts becomes the setting for a true Gatsby affair. A recession-friendly $7 advance admission gives you access to one of the Summers' most magnificent celebrations. Widely anticipated by flappers, sporting gents and tiny tots alike, this event has been featured and reviewed consistently by The New York Times, who selected the Jazz Age Lawn Party as one of the most memorable parties of 2009. *Special guests Drew Nugent & the Midnight Society. *A delightful variety of refreshing cocktails will be served by St-Germain Elderflower Liqueur and beer provided by Brooklyn Brewery. *Homemade barbeque, sandwiches, salads and more will be for sale. Vegetarian dishes available. *Soda, juice, water, and other beverages available. *Authenitc '78 records from the 1920s played on a phonograph provided by Michael Cumella of WFMU's Antique Phonograph Music Program. *1920s Motorcar Exhibition - take a spin around the island in a genuine rumbleseat; hold on to your hat! 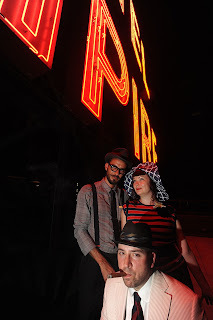 *Vintage clothing dealers and boutique milliners Odd Twin, Zelda Magazine, Peter Lloyd Greer Custom Clothes, and more! - They will all be peddling wares, so be sure to tuck some cash in your garter. *Pie Recipe Contest -- If you'd like to sign up for the pie contest, you must pre-register by emailing Sarah Liston at govislandpie@gmail.com. Bakers can sign up until midnight Fri. July 16th. *AND MORE ATTRACTIONS TO BE ANNOUNCED! 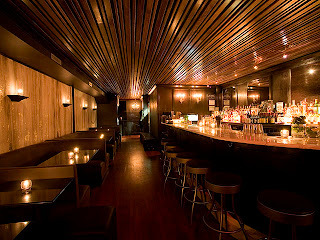 **The first 250 people to order advance tickets at BrownPaperTickets.com get a free drink ticket! Fredo & Brian P, the Old Boys, enjoying some smokes. By popular demand, below is the cocktail menu I put together for the recent Liberty Belle Fourth of July Spectacular at the Empire Hotel Rooftop bar. A big thank you to Justin Noel from Contemporary Cocktails for helping me batch the punch and prep the ingredients. 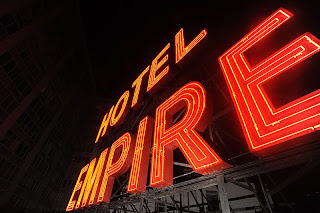 The bar staff of the Empire Hotel bar were pros despite the over capacity crowd. Combine ingredients in bar glass. Add ice and stir until chilled. Strain into Old Fashioned glass and add several large ice cubes. Garnish with orange and lemon peels. 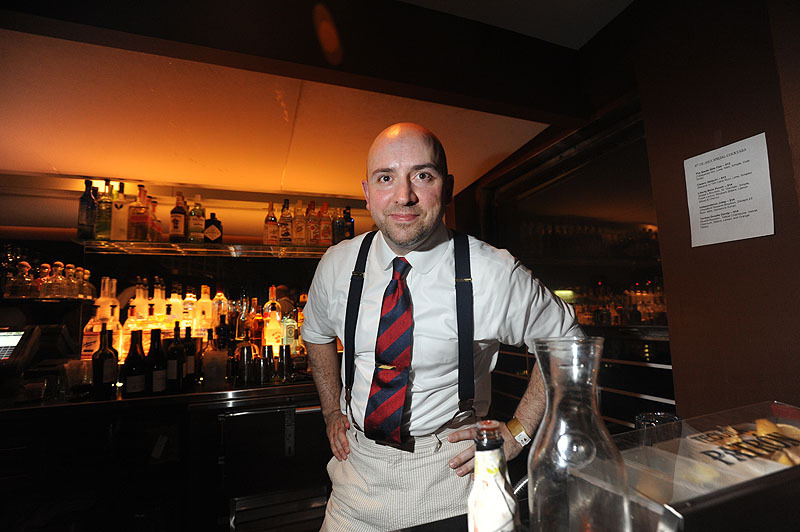 This recipe is a variation of Giuseppe Gonzalez’s “Dandy” series of cocktails (he used scotch or gin) at Dutch Kills. Gently muddle mint with lime juice in bottom of mixing glass. Add gin, syrup, and ice and shake well. Pour into a Collins glass and top off with club soda. Garnish with mint. Gently muddle the mint and Demerara sugar in bottom of bar glass. Add the rum and bourbon then strain into a chilled highball glass over crushed ice. Stir the mixture, garnish with mint and serve. Combine everything except sparkling wine in shaker, add ice and shake until well chilled. Strain into goblet and top off with sparkling wine. Garnish with lemon wheel and cherry. Combine ingredients in a shaker with ice. Shake until chilled and strain into a martini glass. Garnish with Lime wedge. When it comes to summer cocktails I have been following the gospel of drinks writer David A. Embury. Mr. Embury, an attorney by trade, wrote a cocktail book called The Fine Art of Mixing Drinks in 1948 that in my view is required reading for anyone desiring a serious understanding of how to mix cocktails. Bucks are a cousin of the highball cocktail and are generally constructed with a base spirit (such as Whiskey, Gin, Rum), a splash of lemon juice, and ginger ale over ice. The Gin Buck was the original version from Prohibition days when masking bathtub gin developed into an art form which generated hundreds of cocktails. We like Rye whiskey and adding a splash of lemon to the highball recipe makes a wonderful buck indeed. Squeeze a quarter lemon into a Highball glass and add then Whiskey. Add large ice cubes and then top off with pale ginger ale. Stir and serve. Embury Suggests: "An interesting variation of the Rum Bucks may be had by adding a few dashes of Cointreau or orgeat when using Cuban rum and a few dashes of falernum when using Jamaican rum." Another variation of the Buck is the Presbyterian which is enjoying a resurgence in popularity no thanks to the efforts of Sasha Petraske of Milk & Honey. This version has has both ginger ale and club soda. Add Rye to Highball glass, squeeze in a lime wedge, then add equal parts ginger ale and club soda. Garnish with candied ginger. Rickeys are very simple yet classic summer cocktails that used to be popular with the sporting set. Essentially, they are the base spirit (we suggest gin or rum), the juice of one lime, and a teaspoon of sugar or other sweetener. A key difference from a regular fizz or collins is that the Rickey should be served in a shorter 8 oz glass. It is a short drink meant to be imbibed quickly for faster refreshment. Combine Gin, Simple, and lime juice in an frosted 8 oz glass, add large ice cubes, then top off with club soda. Garnish with lime wedge. Combine Rum, Falernum, and lime juice in an frosted 8 oz glass, add large ice cubes, then top off with club soda. Garnish with orange peel. This would work very well with Jamaican rum too. Embury suggests: serving the Rickey "with stirring rod or small bar spoon. "He also advises that using the basic formula above, one can make the following: Applejack Rickey, Sloe Gin Rickey, Bourbon Rickey, Southern Comfort Rickey, etc. Combine Gin, Sloe Gin, Lemon, and simple in a shaker, add ice and shake rigorously until chilled. Strain into a short glass and top off with club soda. Garnish with lemon peel. A favorite variation of the fizz was country club favorite in the 1950s called the Southside. The drink originated at the 21 Club in New York during Prohibition where it was the house cocktail for many years. It is built like a mojito but with Gin instead of rum. 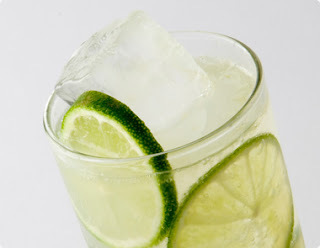 The principal difference is the Southside should be shaken over ice to blend the lime juice, simple, and Gin and break the mint into small particles. Gently muddle mint in bottom of bar glass, add simple syrup, lime juice, and gin. Add ice and shake until chilled. Then strain into a iced goblet filled with crushed ice. Top off with club soda and garnish with a mint sprig. Collins is a type of "sour" with soda or charged water served in a tall Collins glass instead of a rocks or highball glass. Embury insists the original Tom Collins is a (1) made with Old Tom Gin - a sweetened gin and (2) it is stirred otherwise it would certainly be another type of Fizz. These days many bartenders shake the ingredients, then strain into a Collins glass, and then add soda. This tall drink is meant to be drank over a long time so the charged water needs to filter through the whole drink not merely provide fizz. Combine gin, lemon juice, and simple syrup with ice in a Collins glass. Stir well and add 4-6 ice cubes. Top off the club soda. Garnish with orange slice and Luxardo maraschino cherry. Another version of the Collins family which we enjoy was passed onto me by barkeeper Henry Lopez of Court & Spark in Carroll Gardens, Brooklyn. Combine gin, lemon juice, and cherry Herring in Collins glass. Add ice and then stir in the club soda. Garnish with Luxardo maraschino cherry and lemon peel. Enjoy these Summer Cocktails. They are easy to make and will enhance any summer BBQ or outdoor party. Tom Collins base mixture can be batched ahead of time and then added over ice then topped with chilled cold club soda. Gin Rickeys take no more time to make than a Gin & Tonic. Oh, and let me know your summer cocktail favorites. I am always open to new refreshing recipes! Dances of Vice, The Champagne Riot, The Salon, and Wit's End join forces to present an unforgettable swing-era vintage Fourth of July extravaganza featuring vintage patriotic melodies by Gelber & Manning and the Star Spangled Orchestra, rockabilly ballads, boogies and blues by SIT & Die Co, bugle boy extraordinaire Bob Leive, performances by tap sensations The Minsky Sisters, mesmerizing burlesque by Jezebel Express and Perle Noire with special guests The Rhinestone Follies, and the dapper MC Dandy Wellington! 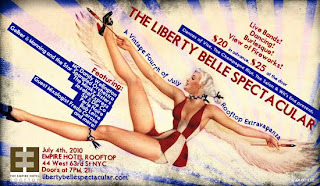 Join us at the rooftop of the lavish Empire Hotel, featuring a fantastic view of the fireworks, live bands, burlesque, swing dancing, and delicious cocktails designed by Fredo of Loungerati under the stars! Get there early to avoid lines! I most likely will be rolling drinks for your pleasure!